First of all I selected small sections from a number of drawings in my sketchbook that have potential for further development. I chose four images from this selection to develop further. 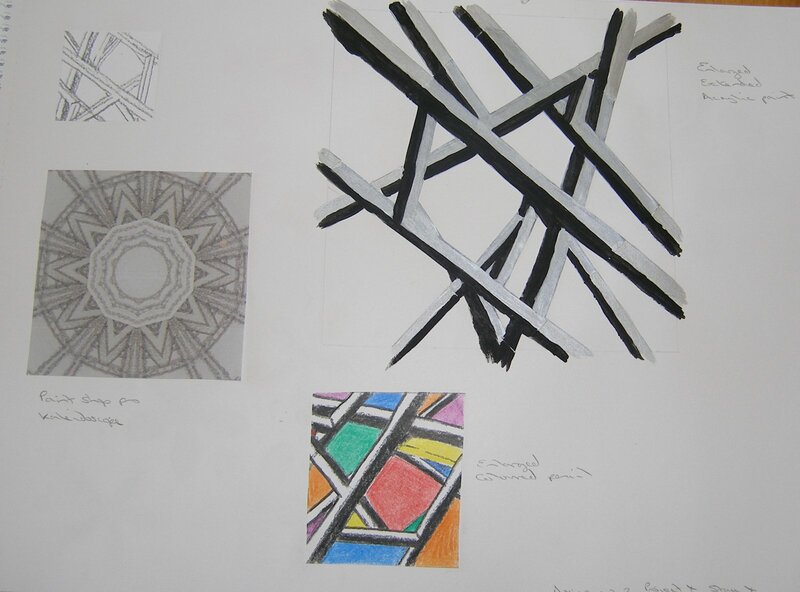 I photocopied the image and then rotated sections to form a square pattern with a hollow centre. Taking a single petal shape, I made a paper collage of just that shape. I took the central part of the image and expanded the shapes into flowers, copying the two toned colouring. I then took the shape from the tip of the stamens and scattered these amongst the new flowers. The new flower shapes would make a good repeating design and I like the new image of the single petal shape but am not sure at this stage how I would develop this. I scanned the image into Paintshop Pro and created a kaleidoscope. I enlarged the image, centred it in a square and extended the legs then painted with acrylics. Finally I enlarged the image and filled in the negative spaces with blocks of colour. I don’t like the result of the kaleidoscope, as while it is very different to the original I think it loses the strong boldness of the original lines. I do like the starkness of the enlarged and extended version and the coloured blocking of the negative shapes in version 3. Firstly I used Paintshop Pro again, and this time used the Feedback tool to change the image. My second version was to do horizontal and vertical flips in PSP to create and image that would tile well. 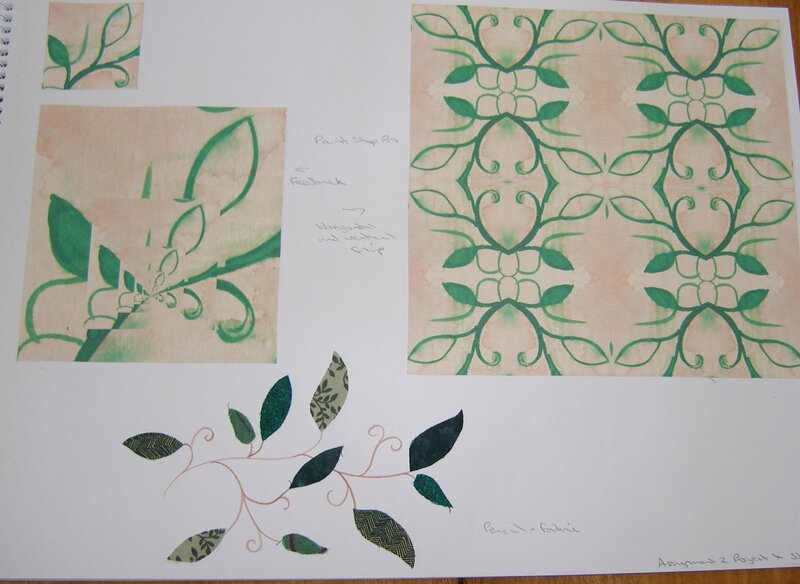 I also extended the image with a line drawing and fabric collaged leaves. I like all these versions, I think they have a lot of potential for further development either as repeating images or single forms. 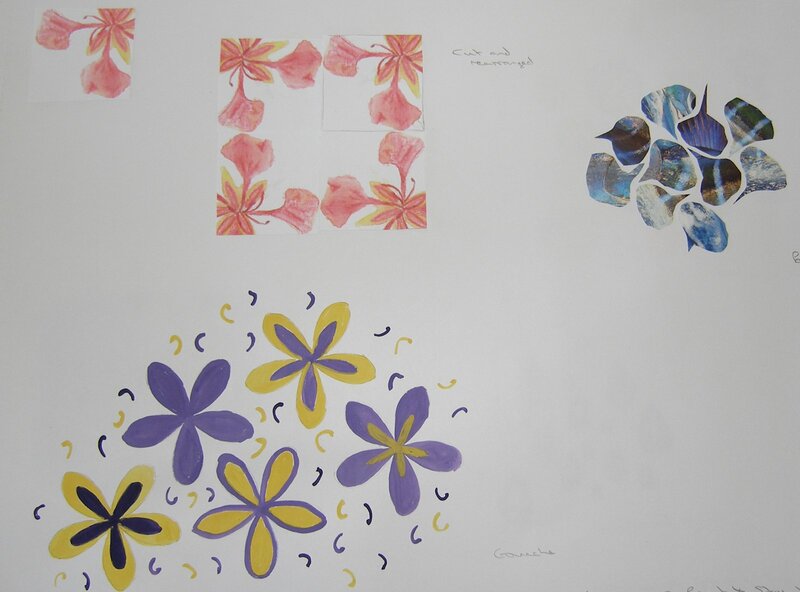 I repeated the design just in different colours and in gouache paints. A paper collage version using origami papers. Oil pastels layered and then scratched to reveal the colours underneath. Changing the shapes to teardrops but retaining the shape within shape detail. 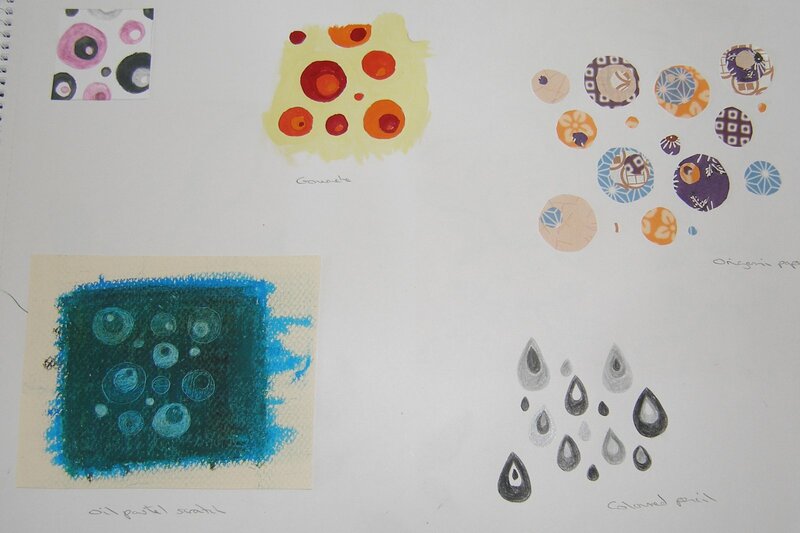 I feel these were successful experiments, particularly the paper collage with the added interest of pattern. Using the variation of the single colour in the oil pastel scratch produced a complete contrast that also works well with good balance of light and dark.